Thomas Shawver is a former marine officer, lawyer, and journalist with American City Business Journals. An avid rugby player and international traveler, Shawver owned Bloomsday Books, an antiquarian bookstore in Kansas City. 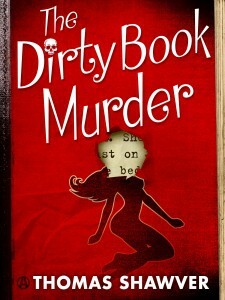 I stayed up all night reading The Dirty Book Murder, not because I’d forgotten that I was supposed to review it, but because it was that good. It opens a bit slowly, with main character Michael Bevan going to an auction because there’s some rare Japanese erotica he might want for his used bookstore, but very quickly turns into a fast-paced neo-noire murder mystery replete with mobsters, movie stars, and an estranged daughter. It’s also got enough literary references, references, I might add, that are relevant to the plot, to make any bibliophile want to start tracking the various times Collette, Hemingway, and others are invoked by characters in the story. And then there’s a hint of romance, though this book is in no way a love story, unless it’s a love of reading and literature, and the preservation thereof. This book should appeal to both those who like their mysteries a little bit cerebral, but it should also be great for those who were raised on hard-boiled detective novels, as there’s a bit a both. Goes well with Shepherd’s pie and Irish beer. This review is part of a virtual tour sponsored by TLC Book Tours. For more information, and the complete list of tour stops, click HERE.